ePublishing Knowledge BaseePublishing Knowledge BaseePublishing Knowledge Base Creating and Managing EventsHow do I review the list of attendees who have registered for an event? Your site has two ways it may notify you of who has registered to attend one of your events. This article will review how to access and modify each. When you create the event, you may change this setting in your System Settings to notify you by email each time someone registers for an event. You may also add members of your internal staff to be BCC'd on this email. 1.1. To turn this feature on, go to your System Settings under Sys Admin. You must have appropriate privileges to access this tool to turn this feature on. 1.2. Scroll down to the events.bcc.email.enabled system setting. Click Edit to view the settings. 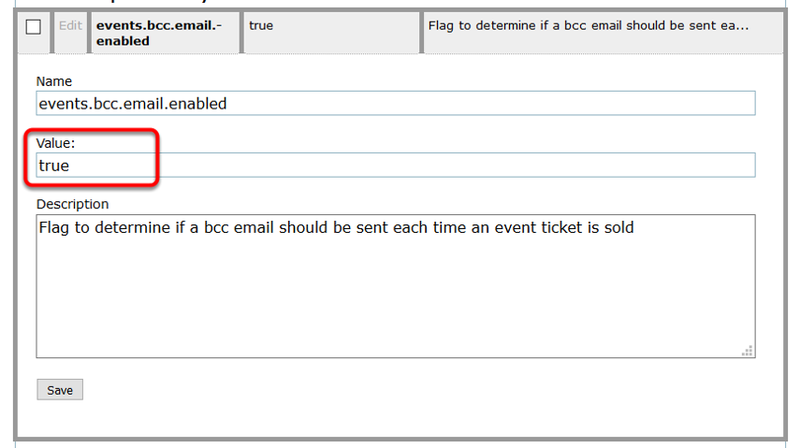 Zoom: Scroll down to the events.bcc.email.enabled system setting. Click Edit to view the settings. If the value is [empty] or false, no email will be sent to either the event contact or your team. If the value is true, the email will be sent to both the event contact and your team. 1.3. To change from true to false, or false to true, click Edit. Change the Value to true or false. Do NOT change the Name or Description. Zoom: To change from true to false, or false to true, click Edit. Change the Value to true or false. Do NOT change the Name or Description. 1.4. Click Save to preserve your changes. 1.5. If set at true, the email will be sent to the email in your webmaster.email system setting. Confirm the webmaster.email system setting contains an email address or mailing list. 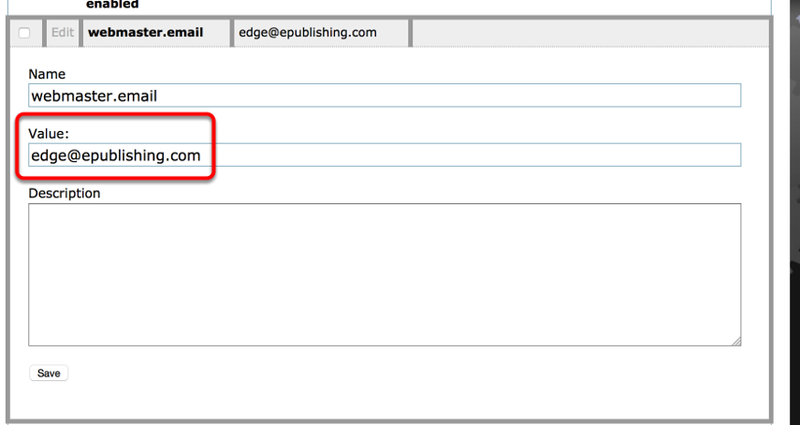 Click Edit next to webmaster.email to change the email address associated with the webmaster.email. 1.6. Please note that this field should be a single email address, and not a comma-delimited list. We recommend using your email service to create a single email address for this purpose. Add any users who should receive these emails to that list. Zoom: Please note that this field should be a single email address, and not a comma-delimited list. 1.7. If you change the email address in webmaster.email, click Save. Export all of the attendee to an Excel spreadsheet. 2.1. 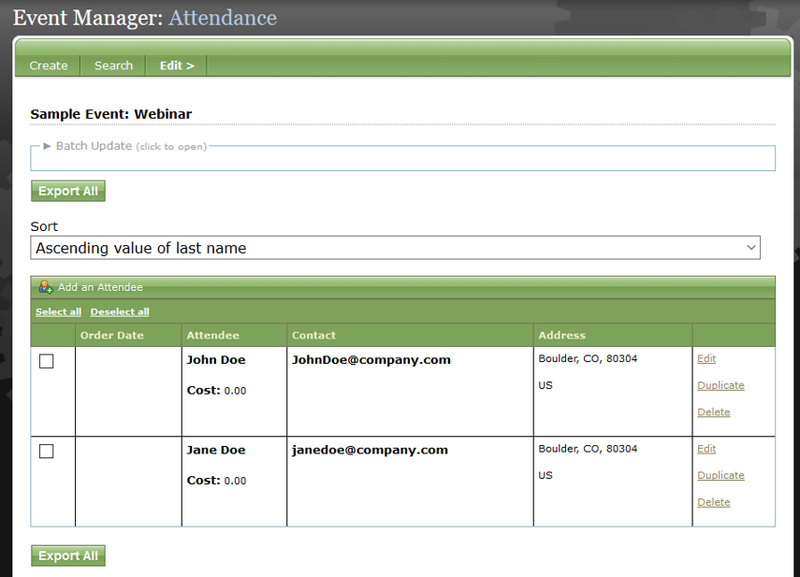 To open the Event Attendee Report, open your Event in the Event Manager. 2.2. 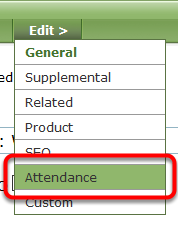 Click Attendance under Edit. 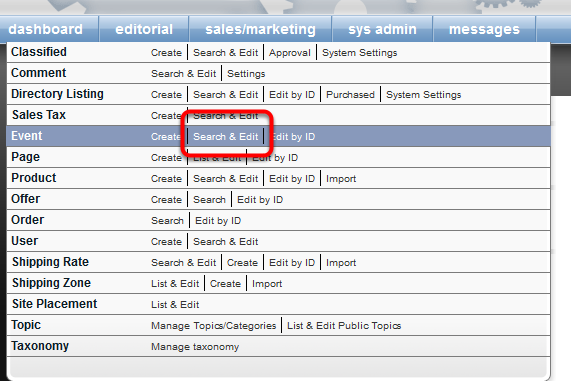 To edit an attendee's details, click Edit on the right. To delete, click Delete. 2.4. Note: There is presently no way for users who have registered for an event to revise their registrations without calling the publisher. Prev: How do I change the order of custom event details? Next: How do I control which attendee information is required for event registration?